Here is a first look at Dendrophylax Lindenii – my lil’ 8×8″ violet graphite piece for Travis Louie’s “Zombie” group show, opening on May 25th at NYCs Last Rites gallery. I’ve always loved how odd and disjointed and shambly these portraits looked, and they immediately came to mind when Travis told me about the show’s theme. I also dig the sketchy quality, which I decided to keep for my piece, as well. And what exactly is a Dendrophylax Lindenii? It’s the Latin name for a flower called the Ghost Orchid. Since starting my Alien Botany series, I’ve become infatuated with orchids – it was only fitting to include them here. I love it! The color is so delicious! Thanks, Cristina! I love this shade, too (and it matches my hair, which is always a plus). Dawne, thanks! Usually, I tend to over-polish everything, so letting this one stay raw felt really good. I’m glad it translated well, and – a number of peeps seem interested in this is a print, so I’ll see what I can do about that. 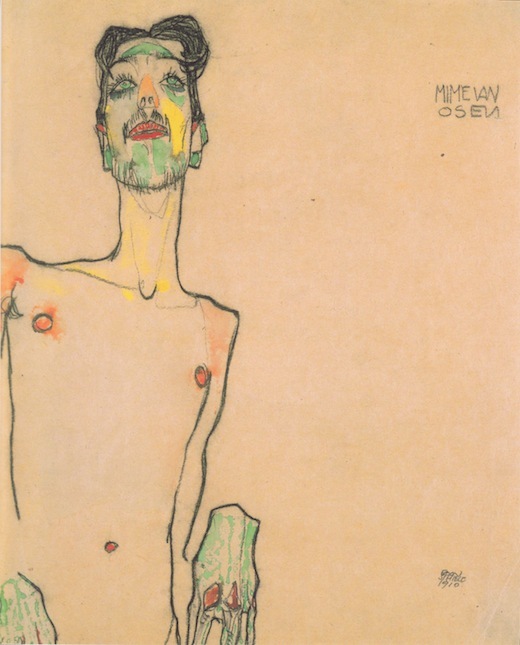 I love Egon Schiele, and your piece looks… succulent. I want that on a shirt and as a print!! !